The movie is about 4 men - retired professor-turned-chauffeur Purushottam Suri a.k.a. 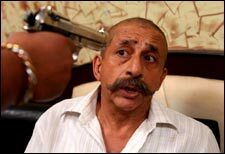 Sir (Naseerudin Shah), pimp and failed singer Bhaskar Sardesai a.k.a. Bobby (Atul Kulkarni), car thief and Fiat enthusiast Albert Pinto (Kay Kay Menon), and petty criminal Shakti Chinappa (Ravi Kissen). Their monotonous, insecure lives pass them by, until Sir decides to grab an opportunity by the throat. Without going into details, suffice to say that they have their eyes on Rs. 20 crores, which they plan to acquire. For some reason, they decide to dress up as cops to do that, and jump into an adventure without any planning. Their problems begin when they become involved in an ongoing operation to nab a gangster. So far, so good? Not really. To begin with, it is all supposed to happen one night, and the director yo-yos between trying to keep the long night interesting, and then changing his mind to insert irrelevant flashbacks of the characters. The setting-up takes a while, and a few yawns later, the main movie begins. It is not always easy to sustain a comedy, and Hriday Shetty cannot be blamed entirely. The screenplay and the dialogues become repetitive after a point, and awkward pauses and transitions are covered up by unintelligent slapstick. No smart bantering and absolutely no quick-witted one-liners. What is unfortunate is that the movie has all the right ingredients to become a clever comedy. Like the 4 men in the movie, the makers seem to set out to make a killing, but realise much later that the ensuing chaos is a result of their mismanagement and lack of development. The one feature Shetty gets right, however, is the Mumbai setting. The photography does justice to the mean streets of the city at night. Add to that a dash of rain, and you are good to go. The police van, licence plate 4084, that the goons roam around in, is another character in the film, and is as much a part of the city's nightlife as the pimps and criminals. Now if only the music had as much impact! Once it is established that the plot points are weak and the story is predictable, the best thing to do is sit and watch the actors. And you will not be disappointed. Each and every one of them, from the leading four men to the one-sequence characters, has done a tremendous job. While the Shweta Bhardwaj track seems a little forced, her presence in a male-dominated movie offers the much-needed distraction. Naseerudin Shah is as much at ease with his character as a chauffeur, as he is with his Professor avatar. It is this versatility that makes the movie worth watching. The others are not to be undermined - Kay Kay Menon is terrific with his blank, confused expressions, Atul Kulkarni makes a great lecher, and Ravi Kissen is almost believable as a Kannadiga. All of them seem completely at home with the farcical and preposterous mess that goes around them, and, as an ensemble cast, they look their parts and have great chemistry. Of course, the movie is also a comment on the society that we live in today, and the scams and corruption that we turn a blind eye to. Despite the ludicrous slip-ups, such as the presence of only two guards for Rs. 20 crores, and Ravi Kissen's mixed accent of no particular origin, there is a lot that you can identify with and relate to, and you may just wonder, in between laughs, how it is that we let the world turn into what it is today. Be the first to comment on Chaalis Chauraasi! Just use the simple form below. fullhyd.com has 700,000+ monthly visits. Tell Hyderabad what you feel about Chaalis Chauraasi!